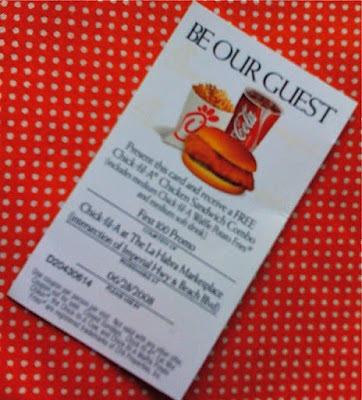 I have been hanging on to this very last of my 104 free Chick-fil-a coupons for months and months. I just haven't been able to use it. But as of tomorrow we will have a whole new stack of gratis chicken-y goodness. Because I am camping it up in the 100 degree weather all in the name of free food. Thanks for your awesome first 100 promotion. If only you could open a new one nearby again soon! wow - lucky!!! love chick-fil-a too! Growing up and living in SoCal, I used to go to the one near Hacienda Heights! you are crazier than a I thought :) Although I would totally do the same for in n out! Is it weird that I don't think it is crazy at all? I would TOTALLY do this! Chick-Fil-A is the BEST. I love it Julie! Good luck! I hope it will be cool for you and good luck. Sadly, no Chick Fil A here. :( Have to drive to "the city" to get it. I LOVE Chick-fil-A!!! We always do dress as a cow for free food day! I wish they would open another restaurant closer to our home. We drive 20 miles at least once a week to eat there. Good Food, Great Service! we got a chick-fil-a (in fresno). after all the hype i went... i didn't love it. i wanted to, but i didn't. yum and I dont even eat chicken but I do camp so have a blast!!! Hope you got your free chicken. I just made toffee crack with Swedish tunnbröd which is kind of like saltless saltines. It's all gone now. Yum! I love that recipe! Thanks for sharing. I read on the site they are changing to a raffle format! I hope you get your tickets!! !